With the Australian Open of Surfing in town there's so much happening on the beach front, in town and in the bars, it's hard to know who this whole show is all about. That's why Sprout Daily is happy to give a little to the locals and spread a little local love around. 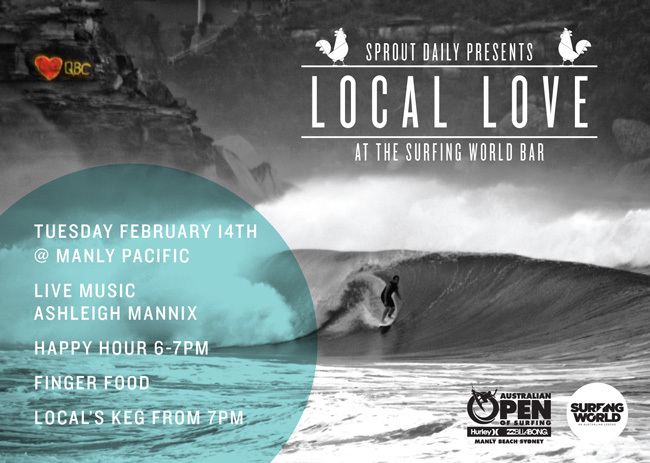 Come on in to The Surfing World Bar at The Manly Pacific on Tuesday 14 February and feel, hear and taste the love. Happy hour will kick off from 6 til 7pm with drink specials. After happy hour we'll tap the Local's Keg for our shout at 7pm and serve up some finger food while our favourite new local girl Ashleigh Mannix plays an acoustic set. Come in and feel the Local Love this Valentines Day with Sprout Daily and Surfing World. The Charlie Bar at The Manly Pacific will be transformed into the Surfing World Bar over the duration of the Australian Open of Surfing and has been decked out with iconic images from past issues of Surfing World and local images from Sprout Daily.